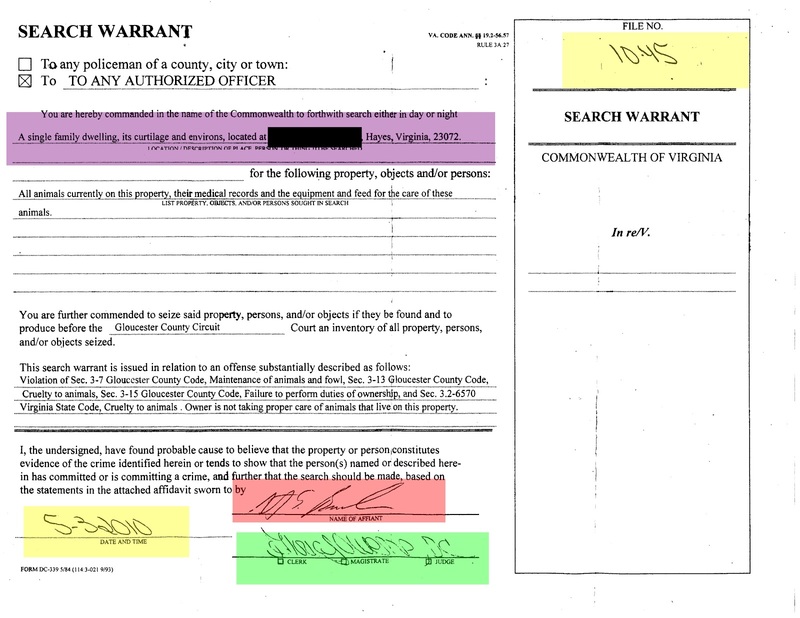 Gloucester VA Links and News: Gloucester County Producing False And Illegal Search Warrants? Gloucester County Producing False And Illegal Search Warrants? 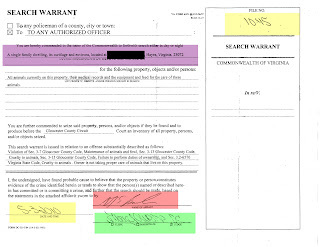 Above is a jpg image of a search warrant issued here in Gloucester County. This is the search warrant that has been in discussion in earlier parts of this overall story. On the surface, it may look valid, but when you start really studying all it's components and asking a lot of questions, you start to realize that there is something very wrong here. At least it is our opinion that something horribly wrong exists. Let's start breaking this document down and asking questions shall we? If you look at the bottom of this document, you will see that it is signed by one Gloria Owens who is a Gloucester County court clerk. She signed this document and marked the box Judge. Gloria Owens is not a judge. She is not a Magistrate. She is a clerk. Okay, in fairness, she has the right to sign this document and mark it for a judge if she was in contact with a judge and was signing it in his place, which would require her to mark it as such but was never done. See VA Code Ann 19.2-56 below. Information we have obtained states that Gloria Owens is the usual go to person in the county whenever a fast form is needed for whatever reason. Now we have no way to confirm this, it's what has been told to us from inside the Sheriff's office. Now let's look at the date and time this was executed. Well all we have here is a date, no time. A time stamp is required by law to be on this document, however, it will not invalidate evidence and or property seized during the search as long as Gloucester County can show the time that this document was created. The search took place on May 4th, 2010. One day after this document was “supposedly” created. We strongly emphasis supposedly. Yet this document does not contain a valid file number. If it was created one day in advance of a search, this document should have a valid file number. It's rather shoddy and shady that this document does not contain a file number seeing as Gloucester had 24 hours advanced preparations. Now let's look at the markings or numbers that are placed in the file number box. 10.45. Could this possibly be a date? 2010, 4th day of May? This search as already stated took place on May 4th, 2010. So it is very feasible that 10.45 means just that. Now opinion is that the real date that this document was in fact created is May 4th, 2010 and after the search began. Or in other words, while an illegal raid was being conducted against those this search warrant has been issued. This is why I have asked for the meta data files on the creation of this document. You can not alter the meta data on a computer without creating a major boot record of such. Again, more reason why Gloucester County really wants to ignore my requests for information? It's better to take a hit for non compliance than to offer up evidence that may just incriminate a number of people? The opinion is that everything had to be created after the illegal raid began to cover the tracks of those guilty parties to the raid. Ah, and I am just warming up here to. Now let's look at the affiant section of the search warrant. The signature on here to the best of our understanding is Steve Baranek of Animal Control. He is the second of two affiant's. His affidavit is in place of the first affidavit where by law, the original affiant does not have to be disclosed to the defendant, however, burden of proof as to why the original affiant is hidden is on Gloucester County. There must be a certain amount of fear of retribution from the defendant against the original affiant in order to hide said evidence. Now here is what I am not supposed to know. The original affiant was under the employ of Peninsula Heating and Air,or PHA at the time. Evidence produced by this PHA employee that was supposedly used to create this search warrant comes into very deep questioning. I have asked for all evidence here and have not received it. It is believed that the PHA employee, through illegally trespassing into areas of a house where he was assigned to work, took photographs on what he considered to be either questionable and or possibly illegal evidence of animal neglect. Now when it comes to accepting evidence and compiling an affidavit for the purposes of issuing a search warrant, the affiant must be deemed reliable. If the PHA employee was criminally trespassing into areas of a house he had no right to access, can his testament be considered reliable? Gaining evidence via committing an illegal act does not prove reliability. View more documents from Chuck Thompson. That would invalidate the PHA employee affidavit. Now what about Steve Baranek's affidavit? Well that was created to protect the original affiant. So now that would make Steve Baranek's affidavit null and void making the search warrant null and void. Problem is, the search took place. These are not the only areas in question. There isn't an area on this search warrant I can't question and show some serious flaws in. I mean this thing is loaded with problems in my opinion. However, I am not going to give everything I know away right now as I am still waiting on evidence from Gloucester County and know that there are many people in the county who are in fact reading this. Plus inside information from the Sheriff's deputy says that all the evidence of this case have been destroyed so it's going to be hard for Gloucester County to produce what we are looking for. This he was told by Sheriff Gentry. After ample time, I'm still going to pick this document clean and show even worse issues than I have put up yet. So far we are looking at a very sloppy search warrant that is at the very least, highly questionable and County officials that are ignoring requests for information to clarify areas of this document. How much worse can it get? You have no idea. At this point, if I have your attention, I would strongly suggest that you start following all the updates on this site as this does not even begin to scratch the surface of everything coming. I have surprises everywhere and on every story coming up that are more shocking than the last.